Legal-tech company Afriwise (www.Afriwise.com) has developed an innovative online platform as a solution to this problem. The subscription-based platform provides up-to-date information about doing business in African countries and is available 24/7. 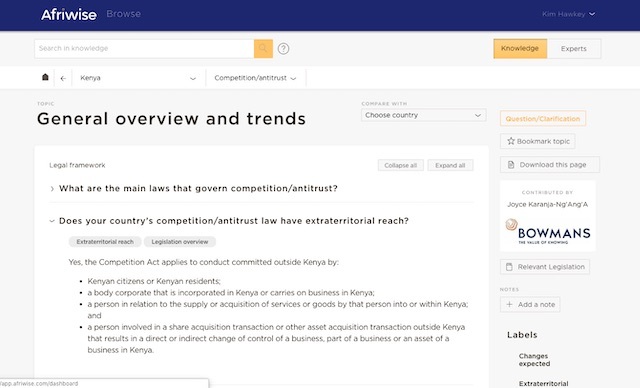 It provides the fundamentals about doing business in African jurisdictions through a Q&A format, with answers provided by local legal experts and divided into key business categories for those wishing to set up or expand shop in an African country, such as business structures, employment, and commercial contracts. The platform is the brainchild of internationally recognised lawyer Steven De Backer, who has worked in Africa for almost 20 years. “We have first-hand experience of how difficult it is to find trustworthy information on local laws, regulations and practices. Our main goal is to help businesses work smarter and more effectively in Africa. Through the combination of technology, critical legal know-how and access to local experts, we believe that the Afriwise platform will transform the way business is done in Africa,” said De Backer.